Forgot your reusable Starbucks cup? There’s an app for that! Wherever my travels take me, my coffee order always remains the same; but the local coffee shop “dialect” always varies: red eye, shot in the dark, dark roast with a shot, etc. Fortunately there is one standard that has trickled its way through coffee shops and that’s the discount java heads get for bringing in their own mug. 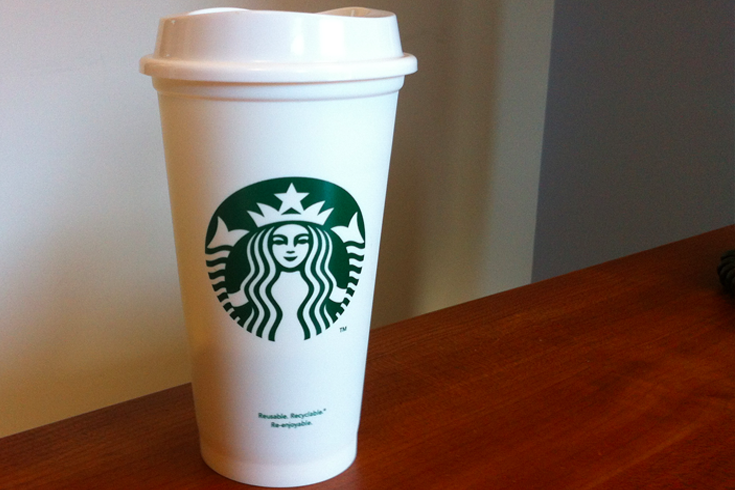 And just this week, Starbucks took the reusable mug concept to another level when they introduced their $1 reusable cup. It’s yet another step Starbucks is taking toward making its brand more sustainable and “eco-friendly”—neither terms of which I’m particularly fond. Along with the new cup, the iconic coffee brand seems keen on advertising the 10 cent discount consumers have been able to cash in on for years. Although 34 million Starbucks beverages were served in reusable mugs in 2011, that represents only 2% of Starbucks total sales. The new cup, combined with an increased awareness of the existing 10-cent discount is a savvy move in terms of both business and sustainability. It’s easy for me to remember to grab my mug on my way out the door; it’s become a part of my daily routine and knowing my decision minimizes my footprint on landfills and the ocean is reason enough. But for many people, the upfront costs of purchasing a reusable mug and carrying it with them don’t outweigh the lifestyle convenience of disposable cups on the go. Starbucks’ cup venture has me wondering how many times coffee lovers will use the plastic cup before they’re able to justify trashing their $1 investment? If enough of these cups are sold, it may even be possible that Starbucks plastic footprint inadvertently becomes larger than it was prior to their $1 offering. And, from a design perspective, the thin-walled cup still requires a cardboard sleeve to prevent scorching the drinkers hand, so perhaps there’s room for improvement here — although, the cup does come with a sturdy reusable lid. At the end of the day, consumers are the ones who make the decision to go paper, plastic or reusable. Two of the biggest obstacles preventing consumers from reducing consumption of one-time use disposable products are convenience and remembering to take along their alternative product. In response to these difficulties, Ocean Conservancy developed a mobile app, Rippl™, to remind people who want to make greener choices every day—and one of these tips is to remember your reusable mug. So if you frequently forget to take your reusable mug to Starbucks, you can customize a reminder on your iPhone that will alert you the same time every day to remember it. And that’s only one of many weekly tips that can help us all reduce our trash impact. We face complex challenges combatting our global trash crisis. There’s no silver bullet, and everyone has a role to play. Starbucks is among the most influential companies in the global marketplace, and their effort to build awareness about the need for a solution is a step in the right direction.